The ocean, that vast body of water covering 71 percent of the Earth's surface, is divided into four major basins: the Pacific, Atlantic, Indian, and Arctic Oceans. These large basins are interconnected with various shallow seas, such as the Mediterranean Sea, the Gulf of Mexico, and the South China Sea. Oceans and seas abound with life, ranging from microscopic unicellular (one-celled) organisms to multicellular (many-celled) animals. Algae is an important life form in the ocean. Life in the ocean is maintained in balance by forces of nature and by predator–prey relationships, unless some external pressures upset the balance. When a balance upset leads to conditions more favorable for the reproduction and growth of algae, an explosive increase in the number of algal cell density occurs. Such rapid increases in the algae population are called algal blooms. During a bloom, a liter of water may contain millions of algae. The most widely publicized type of algal bloom is associated with species that produce a toxin (chemical substance) harmful to animals that feed on the algae (and hence is known as a harmful algal bloom), and/or algae that cause a tint in the water because of the photosynthetic pigments they contain. The latter commonly is known as a "red tide," but different pigments can turn the water red, brown, purple, orange, or yellow. Depending on the circumstances and the species present, a red tide may or may not be harmful. Although not all algal blooms in the ocean produce highly visible effects nor are all blooms harmful, they nonetheless affect life in the ocean and on land in both beneficial and harmful ways. 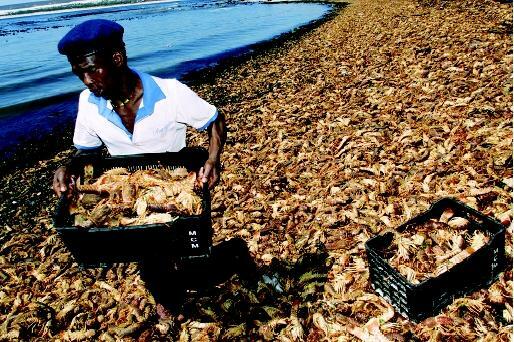 In February 2002, the massive die-off and decay of algae from a nearshore harmful algal bloom (a "red tide") caused a rapid reduction in the water's dissolved oxygen concentration, driving tens of thousands of rock lobsters to "walk out of the sea" near the coastal town of Elands Bay in South Africa's Western Cape province. The lobsters in search of oxygen moved toward the breaking surf, but were stranded when the tide went out. Government and military staff attempted to save some of the lobsters, but others were collected for food. A similar stranding from a massive red-tide event occurred at Elands Bay in 1997. Algae require warmth, sunlight, and nutrients to grow and reproduce, so they live in the upper 60 to 90 meters (200 to 300 feet) of ocean water. The upper layer of water, the epipelagic zone, is rich in oxygen, penetrated by sunlight, and warmer than water at lower levels. As algae and other organisms that live in the ocean die, they fall to the bottom of the ocean, where they decay and release the compounds from which they were made. Under certain conditions, these nutrients can deplete the oxygen in the water. Temperature and salt concentration determine the density of water and how water moves (currents). Cold water is denser (heavier) and sinks from the surface (downwelling). Other water moves across to replace it. Eventually, water at the surface is replaced by water that has risen, or upwelled, from the bottom to the surface somewhere else in the ocean. These upwellings bring nutrient-rich waters to the top. 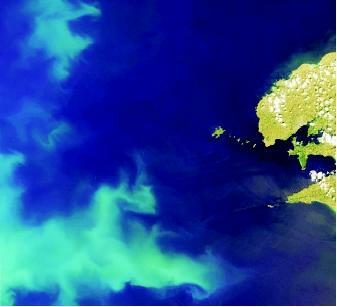 This increase in nutrients can trigger algae blooms. An increase in nutrients also may be caused by activities of humans, such as runoff from animal farms or fertilized croplands and lawns, or atmospheric deposition of sulfur and nitrogen compounds or oxides derived from the burning of fossil fuel . These nutrients lead to blooms in coastal waters to a greater extent than in the open ocean. However, some of these nutrients do find their way to the open ocean far from shore, and contribute to the formation of blooms in the open ocean. Their movement is aided by the wind and by ocean currents. Algae blooms in the open ocean are not usually harmful; instead, they provide many benefits, largely deriving from the fact that the open ocean is relatively unproductive (low in nutrients). Algae are referred to as plants because, like plants, they produce organic compounds from inorganic compounds (carbon dioxide and water) by capturing and using the energy from sunlight. Most algae are eukaryotic , an exception being the blue-green algae (cyanobacteria). Photosynthesis takes place in organelles called chloroplasts in eukaryotic cells. Chloroplasts contain an outer and an inner membrane and pancakeshaped structures called thylakoids. Energy is captured from sunlight by pigments (chlorophylls a and b and carotenoids) stored in the thylakoids. Photosynthesis occurs in two stages commonly referred to as the light reactions (light is required) and the dark reactions (no light is directly required). During the light reactions, energy captured from sunlight is used to split (dissociate) water molecules. Electrons released from this reaction are passed down a series of electron carrier molecules, leading to the storage of the energy in the form of ATP (adenosine triphosphate). This is the form in which living organisms store energy to be used immediately for carrying out chemical reactions and other activities. Oxygen is produced as a byproduct of the light reactions. During the dark reactions (Calvin cycle), six molecules of carbon dioxide are used to make sugar (glucose). Because algae use carbon dioxide and release oxygen as a product of the light reactions, these plants play an important role in maintaining the proper concentrations of carbon dioxide and oxygen in the environment, via the carbon cycle and oxygen cycle. Algae, like green plants, produce the first organic compounds in the food chain and thus are referred to as primary producers. Other organisms cannot use inorganic molecules to make the organic compounds that they need for life, and therefore depend on algae and other plants as the initial source of organic compounds. These organisms either eat algae to obtain organic compounds, or obtain them from the water when they are released after the algae die. Cyanobacteria, also known as blue-green algae, are one of the oldest known types of algae and are believed to have played a major role in the addition of oxygen to the Earth's early atmosphere. Some cyanobacteria carry out nitrogen fixation, which is the conversion of nitrogen gas into nitrogen compounds that can be used by other primary producers. Diatoms are unicellular and have a cell wall composed of silica, a glass-like material, which comprises a shell-like structure called a frustule. Coccolithophore blooms are identifiable via space-based remote sensing because their external plates of calcium carbonate, called coccoliths, backscatter light from the water column to create a bright optical effect. This bloom (the cloudy swirl in lower lefthand corner) occurred in summer 2001 in the Celtic Sea off England's southwestern coast. When diatoms die, the frustules settle to the bottom of the ocean floor and combine with the soil to form diatomaceous earth. Diatomaceous earth is used in products such as filters for swimming pools, as temperature and sound insulators, and as an abrasive in toothpaste. Dinoflagellates have two unequal flagella that help them direct their movement. Many of these organisms contain colored pigments that cause the water to appear colored when these organisms bloom, leading to the terms "red tide" or "brown tide," for example. Some dinoflagellates live in close association with marine animals, such as sponges, sea anemones, giant clams, and corals. The golden-brown photosynthetic cells found in these animals, called zooxanthellae, actually are dinoflagellates. Coccolithophores are cells covered with button-like structures called coccoliths made of calcium carbonate. The coccoliths give the ocean a milky white or turquoise appearance during intense blooms. The long-term flux of coccoliths to the ocean floor is the main process responsible for the formation of chalk and limestone. Coccolithophores and some other algae participate in the sulfur cycle and produce the gas dimethyl sulfide. This is the primary way that sulfur is carried between ocean and land. Dimethyl sulfide leaves the surface of the water and reacts with oxygen in the atmosphere to form tiny sulfuric acid droplets. These droplets are carried over land and fall back to land in the form of precipitation. They also aid in the formation of clouds, which partially block the transmission of harmful ultraviolet light that penetrates the surface water. Cloud formation also is thought to encourage surface winds that promote the movement of surface water, leading to upwellings that bring nutrients to the surface. Algal blooms provide large concentrations of algae that produce organic compounds needed by higher organisms, ranging from oysters, clams, and mussels to human beings. For this reason, productivity increases in areas where algal blooms occur. More algae in the water means that more carbon dioxide is used from the atmosphere and that more oxygen is released into the atmosphere. Oxygen is necessary for many living things, including humans. As noted previously, the production of dimethyl sulfide gas helps protect algae from harmful ultraviolet rays so they remain healthy and thus are able to continue the cycle of sustaining life on Earth. Even in the coldest parts of the ocean, algae provide the primary source of organic material to animals at the bottom of the food chain. Organic materials are moved up the food chain as higher organisms feed on those lower down the chain. For example, algae have been found in Antarctic sea ice. As sea water freezes, algae living in the water are frozen in the ice, where they later can be released during a thaw. These algae are a vital source of food for krill, the shrimp-like organisms eaten by penguins, seals, seabirds, and whales. SEE ALSO Acid Rain ; Algal Blooms, Harmful ; Algal Blooms in Fresh Water ; Carbon Dioxide in the Ocean and Atmosphere ; Ecology, Marine ; Fisheries, Marine ; Microbes in the Ocean ; Ocean Biogeochemistry ; Ocean-Floor Sediments ; Plankton ; Sea Water, Gases in . Castro, Peter, and Michael E. Huber. Marine Biology, 2nd ed. New York: Wm. C.Brown/McGraw-Hill, 1997. Cousteau, Jacques. The Ocean World, 2nd ed. New York: Harry N. Abrams, 1993.
article is good and so much informative Dinoflagellates have two unequal flagella that help them direct their movement. Many of these organisms contain colored pigments that cause the water to appear colored when these organisms bloom, leading to the terms "red tide" or "brown tide," for example. Some dinoflagellates live in close association with marine animals, such as sponges, sea anemones, giant clams, and corals. The golden-brown photosynthetic cells found in these animals, called zooxanthellae, actually are dinoflagellates. "...the production of dimethyl sulfide gas helps protect algae from harmful ultraviolet rays so they remain healthy and thus are able to continue the cycle of sustaining life on Earth." - It implies that algae are the only organisms capable of the photosynthesis "sustaining life on Earth" . - You do not appear to have considered the major costs to many ecosystems of the acid rain that is the "tiny sulfuric acid droplets". Agreed, such acidity caused by algae is small compared to that produced by human activities, but you have simply implied that it is a good thing only.